I remember it well – Friday 14th October 2016. It was the day I clicked a button on the Kindle Direct Publishing website and my first novel, The ’86 Fix, was cast out into the wild. I think it was late February before my hangover cleared, and prompted by several enquiries as to how the book was coming along, I finally got down to the job of actually writing it, or at least starting it. Fuelled by a half-decent idea, gallons of coffee, and breathtaking naivety, I then spent the next five months writing the first draft of The ’86 Fix. Another month of editing and revisions followed before I was brave enough to hand my completed manuscript to a few friends to garner their feedback. They were very positive, and I assumed their views were validation enough to publish said manuscript. At that point I probably should have hired an editor. You live and learn, and that was a mistake I won’t repeat. Anyway, back to Friday 14th October. I recall staring at a page on the Amazon website in wide-eyed wonderment – my book, available for people to purchase. To be honest, my expectations were low. If a few hundred people read it and didn’t hate it, I’d consider that a success. All I really wanted to do was prove a point to myself; that I could write a book. It was just a tick on a bucket list. But over the following weeks, something incredible happened – something I could never have envisaged. 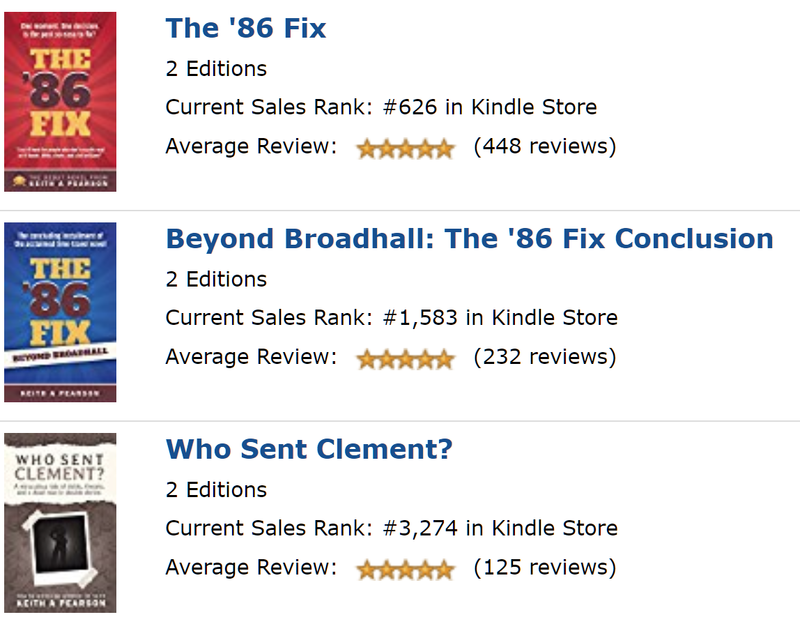 People actually began to buy The ’86 Fix, and to my utter amazement, left positive reviews on Amazon. Complete strangers were willing to hand over their hard-earned cash for my book and then say lovely things about it. It’s impossible to put into words just how humbling that felt. And by the time the hundredth positive review rolled in, I realised my little book might not be quite as crap as I thought. Inspired by the overwhelmingly positive feedback, and the occasional death threat, I absolutely had to write a follow-up. Months of hard work ensued and in February 2017, I clicked that button again. Beyond Broadhall concluded the saga and I then had to determine if any other stories lurked within me. As it transpired, there was another story. In July 2017, I logged-in to my Kindle Direct Publishing account and clicked the button which would place Who Sent Clement? on Amazon’s shelves. The first two books had been so well received, I assumed my luck would run out and my third book would flop. Amazingly, it followed the same pattern as The ’86 Fix and people bought it and again said some lovely things in the reviews. Now here I am, almost one year on from the day I published my first book. From a drunken proclamation in a pub to having sold over 14,000 books, with both The ’86 Fix and Who Sent Clement? Amazon bestsellers. As years go, it hasn’t been too shabby. I have declined two publishing deals (long story) and signed with W.F. Howes to have audio versions of all three of my books produced. The first of those audiobooks, The ’86 Fix, will be released on the 9th November 2017 – another step on this amazing journey. Over the last year many people have commented, via email and in the reviews, how they can’t believe my books are self-published. I suspect the misconception is that you only self-publish if you can’t get a traditional publishing deal, and therefore you’re not a ‘proper’ author. For me, self-publishing is a choice. If I had done what many aspiring authors do, and spent forever trying to secure a publishing deal, I wouldn’t be writing this nor would I have enjoyed the relative success I’ve experienced. I have encountered many aspiring authors who are unwilling to self-publish because they live in hope that one day they’ll find an agent or a willing publisher. They would rather waste years not knowing if their book is any good rather than getting it out there and letting readers decide. Life is too short and personally, I’d rather know if my work is any good, and only readers can ultimately decide that – not agents, not editors, and not publishers. Obviously I’d love to see my books gracing the shelves of Waterstones and WHSmith, but besides that sacrifice I’m very happy publishing my own work. I can write what I want, as much as I want, and when I want. Don’t get me wrong; it’s hard work having to create covers, hire editors, and manage your own marketing, but I think it’s a small price to pay for the freedom us indie authors enjoy. One day I might get to see my books on those hallowed bookshelves, but that carrot isn’t why I write. Obviously selling lots of books does afford me time to write more, but money is not the driving force behind my writing career (yet – I’m going full-time soon so that might change). What compels me to write is knowing that in any given hour, somebody in the world is currently reading a sentence I created, and to know they might be chuckling, or gasping, or frantically turning pages, is beyond mind blowing. I am under no illusion that my career is still in it’s infancy and this could end with one bad book, so I’ll celebrate the highlights while I can. This has been an extraordinary year for me but I wouldn’t be writing this if it wasn’t for the good people who buy, read, and review my work. If I could thank every one of those people individually, I absolutely would, and I’d leave them under no illusion just how grateful I am. That positivity has lead me onto my fourth book, Wrong’un, which is due to be released early in 2018 (click here if you’d like a notification when it’s released). If you’ve read this far, thank you – I hope I haven’t been too self-indulgent. I’ll finish with a little bit of advice for those of you who are thinking about writing a book (who isn’t?) – I implore you to do it. Sit down and write five hundred words a day, and in six months you’ll have written a book – it’s that simple. And don’t for one minute think you need a publishing deal – there are a ton of resources online to help you with all the editorial, technical, and marketing tasks involved in self-publishing. All you need to do is write that book – I did, and it changed my life.